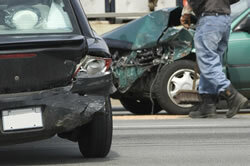 Auto accidents are unplanned, unseen events that can occur anytime to anyone. Some car accidents leave no mark behind while in other cases, a few auto injuries can alter the entire course of a person’s life. In either situation, early identification and prompt treatment can help in decreasing the rate of complications. Back pain is a fairly common complaint after auto accidents and according to a study published in peer-reviewed journal Pain Research and Management, about 44% of the patients who report to a chiropractor’s office for the management of chronic low back pain attribute their discomfort to automobile accidents. In the case of most auto accidents (when the car comes to a sudden stop or after sudden impact), the risk of whiplash injury increases many folds. In the few weeks following auto accidents, most people complain pain around the neck, back and upper abdominal region. This pain may persist for a few days. What are the consequences of lower back pain? Heating pads and painkillers are often helpful in reducing the intensity of pain; but in situations where the pain persists, it is highly recommended to consult Depew chiropractor, Dr. William Palmer. In the United States, approximately 40% of all cases of back pain are treated by chiropractors via spinal manipulation, spinal decompression, inversion therapy, corrective exercises, therapeutic massages and other non-invasive methods. However, that number will likely continue to grow--and it's easy to see why. More and more people are catching on to the beneficial effects of chiropractic care, not only for reducing pain after auto injuries and other personal-injury accidents, but more improving overall health and wellness. If you are experiencing back pain after an auto injury, contact Depew chiropractor, Dr. William Palmer for evaluation of your condition. He'll construct a customized treatment plan to get you back on the road to health today! Freeman, M. D., Croft, A. C., Rossignol, A. M., Centeno, C. J., & Elkins, W. L. (2006). Chronic neck pain and whiplash: a case-control study of the relationship between acute whiplash injuries and chronic neck pain. Pain Research & Management: The Journal of the Canadian Pain Society, 11(2), 79.